As quickly as they came around, the SS18 womenswear shows have come to a close – ending earlier today at Louis Vuitton. 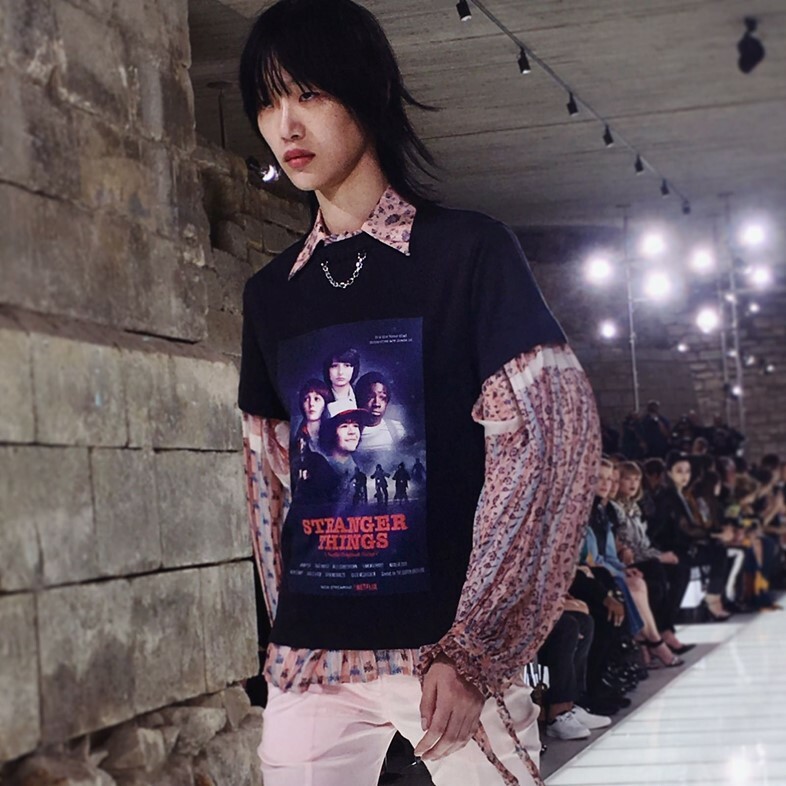 Taking to the Louvre once again, Nicolas Ghesquière’s collection seemed to go in more of a bohemian direction this season. Towards the end of the show – look 37 of 47, to be specific – came model Sora Choi, who wore a black t-shirt layered over a floral-print blouse and frilled baby pink trousers. If you weren’t at the show and were watching the livestream, you may have been squinting at the screen trying to make out what was printed on the tee. Could it be? No, it couldn’t possibly. It looks like the kids from Stranger Things, you might have been thinking. And you’d be right in thinking that because emblazoned on the t-shirt was a movie-type poster for the hit show. While you might be asking yourself why, Ghesquière has been very vocal about how obsessed he was with the show when it came out – same as us TBH. You might remember that this time last year, the designer was hanging out with the stars of the show at the Vuitton headquarters in Paris with promises of an exciting project coming up. Could this tee be a sign of something bigger yet to come? Keep an eye out for more on what that could be, but until then we can’t think of anything better to wear to binge-watch the new season of the show arrives on October 31.